Bulawayo is the second largest city in Zimbabwe after the capital Harare, with, as of the 2012 census, a population of 653,337. It is located in Matabeleland, 439 km (273 mi) southwest of Harare, and is now treated as a separate provincial area from Matabeleland. The capital of Matabeleland North is now Lupane, as Bulawayo is a stand-alone province. Colloquially Bulawayo is also known by various names, these being the City of Kings, Skies, Bluez, Bulliesberg or KoNtuthu ziyathunqa – a isiNdebele phrase for "a place that continually exudes smoke". This name arose from the citys historically large industrial base. The majority of the Bulawayos population belongs to the Ndebele ethnic and language group. For a long time in Zimbabwes history Bulawayo was regarded as the industrial centre of Zimbabwe and the city served as the hub to the countrys rail network with the National Railways of Zimbabwe headquartered there because of its strategic position near Botswana and South Africa. It is the nearest large city to Hwange National Park, Matobo National Park and Victoria Falls. The city was founded by the Ndebele king, Lobengula the son of King Mzilikazi kaMatshobana who settled in modern day Zimbabwe around the 1840s after the Ndebele peoples great trek from Zululand. The name Bulawayo comes from the isiNdebele word KoBulawayo meaning a place where he is being killed. It is thought that at the time of the formation of the city, there was a civil war and a group of Ndebeles not aligned to Prince Lobengula were fighting him as they felt he was not the heir to the throne, hence he gave his capital the name where he (the prince) is being killed. It is said that when King Lobengula named the place "KoBulawayo" his generals asked "who is being killed mtanenkosi (prince)?" and he replied "Yimi umntwanenkosi engibulawayo", meaning "its me the prince who is being killed". At the time Lobengula was just a prince fighting to ascend his fathers (Mzilikazi) throne. It was common at the time for people to refer to Bulawayo as "KoBulawayo UmntwaneNkosi" "a place where they are fighting or rising against the prince". The name Bulawayo is imported from Nguniland which is a place once occupied by the Khumalo people. The place still exists and it is next to Richards Bay. In the 1860s the city was further influenced by European intrigue and many colonial powers cast covetous eyes on Bulawayo and the land surrounding it. Britain made skilful use of private initiative in the shape of Cecil Rhodes and the Chartered Company to disarm the suspicion of her rivals. Lobengula once described Britain as a chameleon and himself as the fly. During the 1893 Matabele War the invasion by British South Africa Company troops led the then king, Lobengula to flee from his burning capital and head north, BSAC troops and white settlers occupied the town. On 4 November 1893, Leander Starr Jameson declared Bulawayo a settlement under the rule of the British South Africa Company and Cecil John Rhodes ordered that the new settlement be built on the ruins of Lobengulas royal town, which is where the State House stands today. 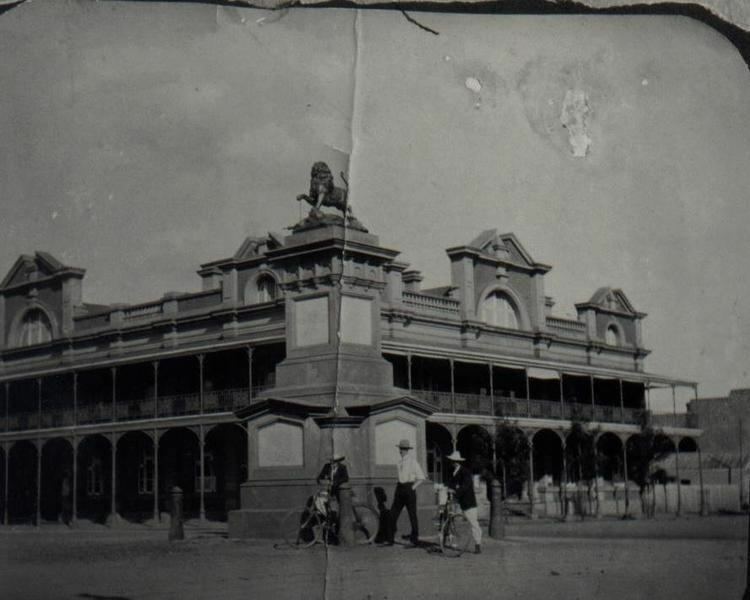 In 1897, the new town of Bulawayo acquired the status of municipality, Lt. Col. Harry White became one of the first mayors, and in 1943, Bulawayo became a city. Bulawayo has long been known as the industrial hub of Zimbabwe. It has a large manufacturing presence, and large industries such as Merlin Textiles, Zimbabwe Engineering Company (Zeco), Hubert Davies, Radar Metal Industries, National Blankets, G & D Shoes, Merlin, Tregers Group, Stewarts & Lloyds, Hunyani Holdings, Cold Storage Commission. However, some of these companies have either moved operations to Harare or no longer exist altogether which has crippled Bulawayos economy. The industries are deserted and the infrastructure has since been left to deteriorate, further deterring investors from operating in the city. The reason for the citys de-industrialization has been heralded to be the lack of infrastructure to support the size of the city and its operations and an unreliable source of water and the collapse of the rail infrastructure which was a core reason of placing industry in Bulawayo to begin with. Many locals argue that it is because of marginalisation they experience against the government due to cultural differences between the Shona in Harare and the Ndebele Proper in Bulawayo because the National railways of Zimbabwe (Headquarters Bulawayo) is a government parastatal and as such should have been thriving had it not been for embezzlement of allocated funds by company executives who are believed to be Shona. The water issue is not new and had brought about the "help a thirsty Matabele" initiative of the 1970s and the Matabeleland Zambezi Water Project which would put an end to the water issue in Matabeleland was drafted, however this project was put on hold soon after independence. these allegations have all been labelled hogwash by the relevant authorities, however they have only fuelled the secessionist initiative into a general opinion. Before the collapse of Zimbabwes rail infrastructure, Bulawayo was an important transport hub, providing rail links between Botswana, South Africa and Zambia and promoting the citys development as a major industrial centre. The city still contains most of what remains of Zimbabwes heavy industry and food processing capability including a Thermal Power Station which resumed operations in February 2011 after a capitalisation deal with the Government of Botswana where Bulawayo would supply 45 Megawatts in three years. Like many parts of the country, Bulawayo has for the past ten years seen a huge drop in service delivery and an increase in unemployment due to the number of resignations of people seeking better prospects across the border. Many people resorted to farming, mining and the black market for sustenance, while others depended on the little foreign currency that would be sent by family in other countries. However, with the introduction of the multi-currency system in 2009, a new approach is seen by investors in the city who admire the already-available infrastructure and the huge workforce and Bulawayo as great prospects for the future and is set to once again contribute greatly to the economy of Zimbabwe. The city is served by Joshua Mqabuko Nkomo International Airport which has been expanded a number of times to cope with the influx of visitors into the region. The Edgars clothing stores are headquartered in Bulawayo. The Rovos rail run luxury train, Pride of Africa makes a stop in Bulawayo for pick up and dropping off passengers. Bulawayo is situated along the Trans-African Highway network important trade route of Cairo – Cape Town Highway. Most of the citys industries are privately owned, especially in the transport sector. Bulawayo is home to the Queens Sports Club and Bulawayo Athletic Club, two of the three grounds in Zimbabwe where test match cricket has been played. It is also home to Hartsfield Rugby grounds where many international Test matches have been played. Hartsfield was developed by Reg Hart, after whom the grounds were named, and on which field many of southern Africas greatest rugby players have competed. It is home to two large football teams, Highlanders and Zimbabwe Saints. Other football teams include Bantu Rovers, Chicken Inn, How Mine and Quelaton. Bulawayo has a number of museums of national importance, including the Natural History Museum of Zimbabwe, National Gallery, Bulawayo and the Bulawayo Railway Museum.